Dr. Connolly strives to provide complete care for her patients. Learn more about all the services she provides. Dr. Connolly will do her best to accommodate your busy schedule. Schedule an appointment today! Patient forms are available online so they can be completed in the convenience of your own home or office. Read no further and call right away, at 517-375-9666! 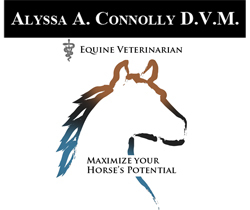 Welcome to the mobile equine veterinary practice of Dr. Alyssa Connolly. Dr.Connolly is a licensed veterinarian in Pinckney, who specializes in the treatment of horses. Recognizing that your horse's health and wellbeing are of the utmost importance to you, Dr. Connolly provides excellent and compassionate equine veterinary medical care. Dr. Alyssa Connolly provides full-service mobile veterinary care, offering routine medical, dental, lameness, and surgical care as well as emergency treatments. With years of experience providing general wellness care and treating serious conditions, her first-rate equine veterinary care goes above and beyond: Dr. Connolly is available day or night for emergency services. Nutritional and illness-prevention recommendations are always provided at appointments, enabling you to better care for your horse and ensure his or her optimal health. "Moving from Florida not having or knowing a vet she was recommended and I must say I was truly blown away! She has a compassion for the animal and wants to help without having you take out a mortgage on your house! Very calm and patient with horse. Happy to have found a vet here that loves horses as much as me smile emoticon easy to get a hold of and quick with results"